Jungle Red Writers: Sharpen your penclls: Man walks his car . . .
HALLIE EPHRON: Everyone knows, we writers get our ideas in the weirdest places. I got a doozy at a yard sale. Another came while I was watching my neighbor being carried out of her house by paramedics. The challenge isn't finding the spark, but where to take it. Story challenge! So today I'm going to share with you a story spark and ask YOU, where would you take it. Points awarded for originality, and a prize to the winner! That makes me laugh. I try to imagine what's going on in the apparently empty front seat of the car. Who's steering? If I stop and asked if he needs help, what would happen? What's in the trunk? I know this is an idea for short story, but all I have is a beginning... Your challenge is to figure out what happens next. The beginning: A woman, driving along the highway, notices a man walking just in front of his car which seemed to be rolling along behind him, driverless in the breakdown lane. She pulls over to see if he needs help. A copy of Lucy Burdette's wonderful new book, MURDER WITH GANACHE, goes to the lucky winner. I am trying to think of a story that doesn't involve a short person. He doesn't look like he needs help, Marielle thought. She had to make a decision quickly, since this was the highway after all, and once she was past him, it would be difficult-impossible--to get back. No question, though, she wasn't going to be silly enough to stop and "help" a stranger--she'd read too many ghastly headlines to be lured into that. Almost up to the man and his mesmerizingly unusual situation. The man stopped--and the car stopped too! He turned, and looked at her, square in the eye. She clapped a flat palm to her chest, almost felt her own heart beating. Could that be? Was that who she thought it was? Wow . . . this is tough, but the picture is amazing, so here goes . . . . Apprehensive, but concerned about the apparently about-to-be stranded motorist, she accelerates to put herself ahead of the slowly-moving driverless car. Stifling the niggling alarm sounding in the back of her mind, reminding her that it is not safe to stop these days, she gives in to her impulse to help. Lowering the window, she calls out to the man, asking if she can help. The man and the car both come to a stop; he shakes his head but says nothing. Shrugging her shoulders, she drops the phone into her pocket and turns away. She’s confident she’s done the right thing, offering help to the stranded motorist. She is surprised by the attack, unexpected and swift, coming from behind. She tries to fight back, but the man, now joined by his unseen companion from the car, overpowers her. With no other cars in sight, they swiftly transfer their cargo into the trunk of her car and jump into the car. Their own car, already the focus of a widening search, is left behind and their would-be rescuer lies crumpled on the side of the road. Oh, heck, I'm a science fiction writer and a humorist. 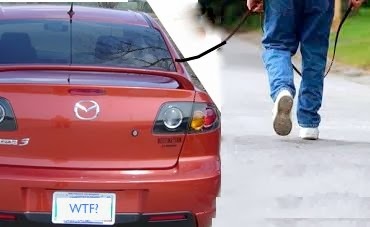 I think it's his pet car, and it needs to be walked so it can poop. What does a pet car poop? What if someone steals your pet car, and it tries to get home by itself? What if he just rescued it from carnappers? Oh, Hank! Knocked it out of the park! How do you do that?? Ellen, laughing! Now there's a question for the ages: What does a pet car poop? She starts to get out of her car, but notices something wrong with this picture. The license plate on the headless car reads "WTF?" She drives off. Just another zombie with a sense of humor. Oh you guys are amazing--and so early in the morning too! I like the dog, Lucy. In your story it would definitely be a dog. A smart one. Martha wouldn't have normally stopped - it was a thirty minute drive to her dentist's in Lincoln on a good day, and she was already running late. But there wasn't anything along this long stretch of the state highway; just a few logging roads turning off the tarmac and the pine woods stretching out a hundred miles and more north and west. And wasn't it queer, the way it looked like there wasn't anyone driving? Just the boy walking ahead and the old Honda Civic following behind. Of course, it had those cheap peel-on window tints like her cousin Dana insisted on using. Worked just as well as having them treated by the dealer, Dana said, but Martha knew better. She signaled and pulled to the side of the road and put her four-ways on before getting out. There was a curve just ahead, but behind her the highway ran straight a good half-mile, so she didn't have to worry too much about some damn fool coming up fast and ramming her Lexus. "Hey, there! You need help?" she called to the young man. Folks from away didn't realize how spotty the cell phone reception was up here in the north. "Do you need a lift into Lincoln?" The boy didn't pause, didn't miss a step. He just twisted around and waved her off. He said something, but he was already far enough ahead so she couldn't quite make it out. She trotted up the verge, keeping to the safe side - she wasn't so old she couldn't put the speed on when she needed to, and she did need to, because the boy was walking faster than it had seemed when she first spotted him. He twisted around again. He looked like a nice young man, maybe a student at UPI or Orono, but not dressed warmly enough for being outdoors in October. He waved her off again. "Go away! Please go away!" Well, not that she was a nosy Parker, but she was a far sight closer to him than she was to her own car, so she jogged on the last few yards. As she passed his vehicle, she did a doubletake. It really was empty. No driver at all. Wasn't that a marvel? Maybe it was one of those Google cars they had, traveling all over the country with no drivers, taking pictures of people's homes. She pulled up to the young man and fell into step next to him. "You know, it's a long way--"
"Get back to your car, get in and drive away. Now. As fast as you can." The boy was so serious, so...scary eyed, Martha stumbled a little. "Go!" he shouted. "Go now!" She blinked. Well. If he wanted to walk all the way into Lincoln with his Google car, so be it. He'd find out the hard way there wasn't any roads or houses between here and Lincoln. She turned and almost stumbled. His car was up close, rolling toward her, not stopping. She scrambled out of the way, awkward, and began walking back to her Lexus. Part 2 - my original was too long! The distance looked wrong. It was...closer. She realized her own car was rolling up the road, pacing the Civic, looking for all the world like one horse following another to the barn. She stopped. Studied the road. Was there a downhill slant she never noticed before? But no, she was sure she had set the parking brake. Hadn't she? She always did. The Lexus growled at her. The Lexus lurched toward her, it's engine suddenly snarling as if it was revving up for a race, and only a firm foot on the brake kept it from roaring straight at her at sixty miles an hour. Shaking, she tried backing across the road. The Lexus followed her, growling, revving, black smoke billowing from its exhaust. She broke into a run and the car screamed, skidded into a turn and roared past her. It spun around, spewing gravel and dead dry leaves behind it. Then it crept toward her. Martha looked up the road. The Civic was rounding the curve. She couldn't see the young man. She turned in that direction and began walking. Immediately, the Lexus settled down. No belching smoke, no deep-throated growl. Just a car, quietly running. By itself. With Martha walking before it. Her thoughts were running around her brain like squirrels in a beano cage. Whenever she tried to get a grasp on "how," her flesh started to creep. One thing was sure to her, though. When they rounded the curve, she'd be out of sight for a moment. She was going to dash into the woods as fast as her legs would carry her. She thought of her coat and cell phone, sitting in the passenger seat of her car. Well, never mind. She was a tough old bird. She could make her way through the trees to Lincoln. Course, it would get dark before she drew near. Could she find her way if she stayed away from the road? Behind Martha, the Lexus growled. She spun around, to find it was almost upon her. Heat - surely it had never run so hot before? - heat radiated off its hood, searing her skin, stiffening her clothing. She turned around, stumbled ahead as fast as she could. When she no longer felt as if she were standing next to an open oven, she took a chance and looked back. The Lexus was about ten feet behind her, rolling contentedly along. Martha shivered. Then she faced forward, and began the long walk. You are amazing, Julia. Seriously. You should use these for something. WOW! And here I'm wondering if the car is a VW Bug with a 53 racing number painted on it. Maybe I need to watch a Herbie movie this weekend. I love these! Julia -- wow! oh my gosh Julia, gotta sell that as horror...we salute you! Oh, so deliciously creepy, Julia! I so wanted to read more. Hank and Joan, I enjoyed your beginnings, too. And, Lucy, doggie drivers would be a vast improvement on some humans I've encountered. I wouldn't dare try to write something after the excellent offerings already posted. However, I will throw out an idea. The woman knows that she shouldn't stop, every bad scenario popping into her head at once, but there is a pulling force overriding all reason that compels her to pull over. She clambers out of the car as if she's late to an important meeting and approaches the young man. He turns to face her, and looking back at her is the spitting image of her late husband, which is quite startling since they were childless. Kathy Reel, great idea! I agree, very compelling. Mark Baker - could be! Aw, thanks Anonymous and Hallie. Now, if I could only write like you Reds. It was only later that Midge realized what she had seen, what had begun that morning on the highway. Why hadn't she paid more attention. Was it true what her boss said to her almost every day, "That's why they pay me the big bucks, and you gotta plug along." But she had been one of the first people in Atlanta to actually see the invasion of the cars, the submission of the men, the new hierarchy. Yes, she had gone from "girl" to "woman" from "secretary" to "executive assistant" but she had always been part of the lower classes. Who knew that automobiles would be the liberators? She let the phones ring. Brilliant, Denise Ann - Shades of The Day of the Triffids! Hallie, you're probably thinking of My Mother the Car. Never seen it, but I'm guessing that's the one you meant.